Falmouth, located in Cape Cod's Barnstable County, is one of the older resort communities on the Cape. Many people enjoy and live in Falmouth because of its easy access to the Woods Hole ferry. The Woods Hole ferry offers quick connections to both Nantucket and Martha's Vineyard. It is the second largest town on the Cape and is made up of multiple villages including Woods Hole, East Falmouth, West Falmouth, Falmouth Village, North Falmouth, and Teaticket. There are over 68 miles of coastline in Falmouth and many beautiful beaches. The Nobska Lighthouse is a beautiful seaside spot for some of the best views of the water. It is a great year-round spot for sunny strolls and picnics. Falmouth's Main Street is its downtown location. It is a charming downtown with historic buildings, galleries featuring Cape Cod artists, boutique shops, and restaurants with locally sourced ingredients. Explore all listings for sale in Falmouth, MA below. Questions about Falmouth? 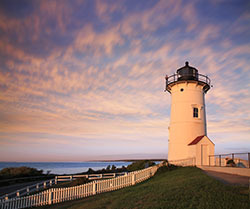 Ready to view some Cape Cod homes? Call us now or fill out this online form! Charming Ranch in the most ideal location in Falmouth!! Main Street shops, Island Queen Ferry & Heights Beach all just minutes away, this is the location for you! Second home, investment property or year round... this house is the perfect location for all the above. Updated in 2004 w/new kitchen cabinets, tile floor & granite counters. Renovated bathrooms with walk in shower. Wood floors in liv room & two of the three bedrooms. Gas fireplace, Central air conditioning, Gas heat, 1st floor laundry, 1 car garage... some of the exciting features here. Full basement & walk up attic for expansion possibilities as well! Great private yard with Koi pond, ready for the new owner to enjoy! NOT in a flood zone as well. Buyer to assume sewer betterment...newly installed. A location not to miss! Buyer to assume Town Sewer Betterment Balance of approx $13K. Hook up lines paid for by Seller. Charming Cape in mint condition. Brand new hardwood floors in living room and dining room, kitchen with granite counters and stainless appliances, first floor master with full bath. Sliders to deck and very private rear yard abutting open space. One car garage with breezeway to house. Located in the village of Waqquoit on a corner lot with no subdivision restrictions.Move right in to this home in tiptop shape! Rare opportunity to own on Bywater Court just around the corner from Surf Drive Beach! Absolutely adorable, well maintained home with a beautiful deck and efficient three season room. This house is a great investment/vacation/retirement property and is ready for you to make it your own! The house is perfect as is or you can follow the Bywater trend and knock it down, rebuild and capture amazing views of Martha's Vineyard, Elizabeth Islands, Nobska Light and Surf Drive Beach. Life is short, buy the beach house!